Prestige Vending is dedicated to its' customers and strives to maintain a high level of service and professionalism. Call us today to see how we can help provide refreshments to your employees or snacks to people visiting your company satisfied. 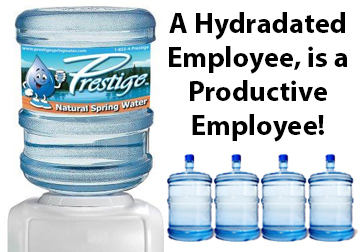 Keep your companies thirst satisfied with Prestige Vending. Whether you need prompt water service or multiple vending machines installed or maintained, one call does it all. Offices of all sizes, retail locations, warehouses, repair shops, no matter what the need Prestige Vending is your best choice. We can provide bottled water service, coffee machines, tea, snack machines and office supplies... one call really does it all. Have the convenience of bottled spring water delivered to your door. Deal with a local Long Island based water delivery service.